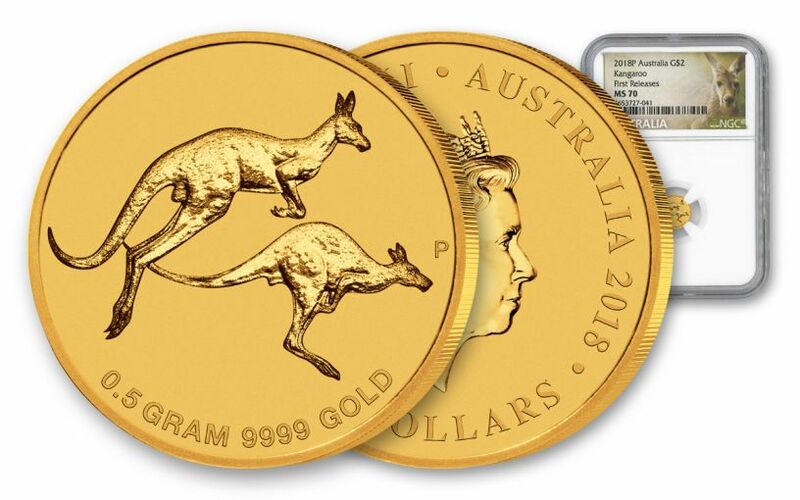 If you’re looking for a unique, affordable way to start or expand your gold collection--while celebrating one of the most familiar images of the Australian outback--look no further than the 2018 ½-Gram Gold Mini Roo Uncirculated First Release coin. This exciting coin features the kangaroo, which has become so popular over the years that it is now an unofficial emblem of Australia, appearing on various government crests, corporate logos, and, of course, coins. The depiction of the kangaroo on the Mini Roo coin is sure to delight as well. With a reverse designed by Jennifer McKenna, it features two bounding red kangaroo, one of the four largest species of kangaroos native to Australia. The coin is issued by the Perth Mint, founded in 1899 as the third and final Royal Mint facility in Australia. The Perth Mint is the oldest operating Mint in the country. Given the Mini Roo coins’ affordability and style, there’s simply no better way to give the gift of gold, than with the 2018 ½-Gram gold Mini Roo Uncirculated First Release coin. And you can get yours now, from GovMint.com. Boasting a weight of .5 grams and a diameter of 11.60 mm, these Mini Roo coins truly live up to their name. But their uncirculated condition and beautiful strike of 99.99% pure gold will make a statement in your international collection. PURE GOLD CAPTURING THE FLIGHT OF THE KANGAROO -- Jennifer McKenna’s highly detailed design on the 2018 ½-Gram Gold Mini Roo Uncirculated First Release coin instantly catches the eye. 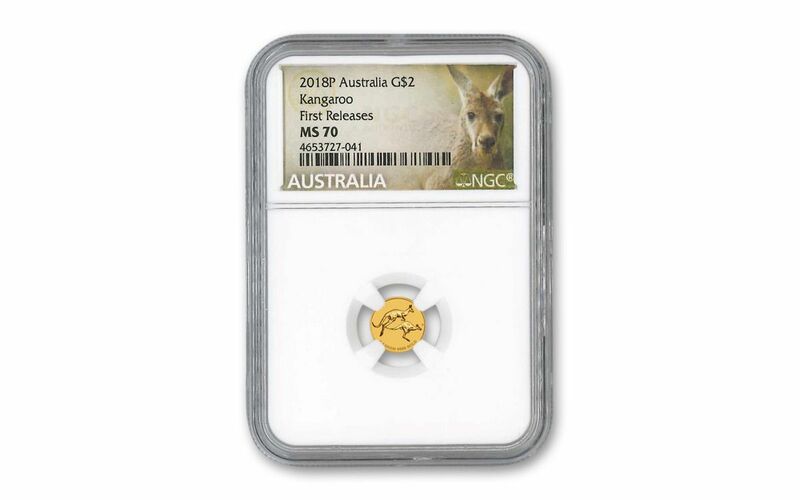 Featuring two members of the red kangaroo subspecies as they leap across the open plain of the design field, the reverse also includes the inscriptions "0.5 G 9999 GOLD," and the Perth Mint Mark. The obverse of the coin features the Ian Rank-Broadley bust of Queen Elizabeth II, facing right. Also on the reverse are the inscriptions "QUEEN ELIZABETH II," "AUSTRALIA," "2 DOLLARS," and "2018." AFFORDABLE PRICING AND EASILY STORABLE SIZE -- In addition to the the ½-gram weight of the Mini Roo coin ensuring their easy purchase, the coins’ small size offers another advantage as well: ease of storage, particularly discreet storage. 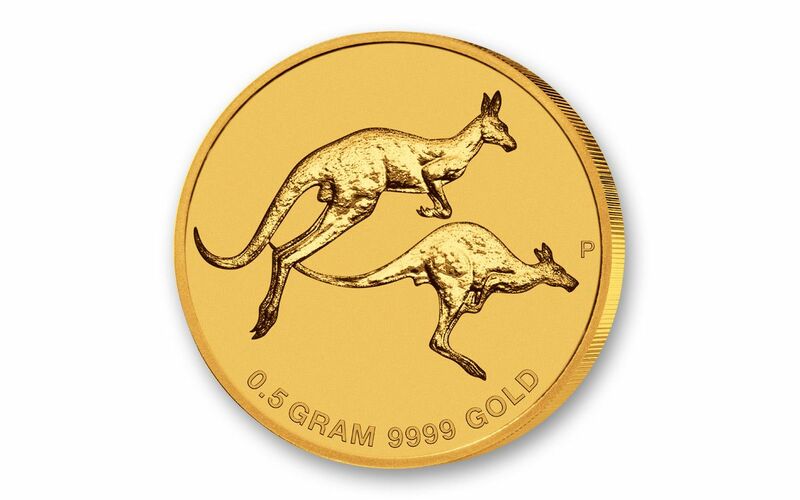 UNCIRCULATED, FIRST RELEASE CONDITION -- Each of the 2018 ½-Gram Australian Gold Mini Roo Coins in this release is in Uncirculated, First Release condition. Coins in this condition exhibit no signs of wear and tear, though you may notice a range of minor flaws such as breaks in the luster, spotted surfaces, and contact marks from the coining process. 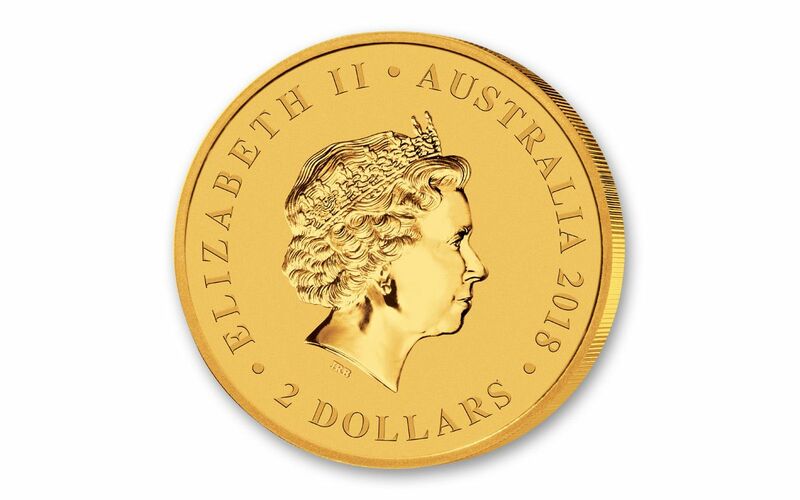 CERTIFIED LEGAL TENDER -- The 2018 ½-Gram Gold Mini Roo Uncirculated First Release coin is $2 Australian legal tender Australian. Whether you’re looking to build your own gold collection or start the collection of another, the 2018 ½-Gram Gold Mini Roo Uncirculated First Release coin is both affordable and exceptionally well-struck. Get it now from GovMint.com.